Can I let you in on a little secret? I almost quit this dream of mine earlier this year. The truth is life had been hard for awhile and at that point, everything just piled up and I got overwhelmed with all.of.the.things. From my marriage, my kids, a cancer scare, extended family, living in a place where I did not have a lot of friends, working outside of my home, and not getting my ideal clients with my own business I found myself feeling like I was drowning. I barely managed to get through my workload and once I did I did not pursue any further work for a few months. This was a scary and sad time in my life because up until then I had given everything that I could into everything and everyone in my life. Feeling defeated and unmotivated to continue to do what I had loved for so long was heart-breaking. Two little words that were drilled into my head and my heart all those years ago while I was at basic training at Fort Jackson, South Carolina was “Always Forward”. After a few months of just rolling through the motions, these two words crept back into my life. “Always forward” played in my head over and over again in a dear friend’s voice that gave the ultimate sacrifice. I sat myself down and started to write out my whys for everything – for working outside of my home vs staying home full time with my kids, for my workouts/nutrition, for Writefully Simple. As I was writing it all out I found my motivation and my desire to build my business and to better myself came rushing back for the first time in almost 6 months. It was incredible. The truth is – life is going to be tough and curveballs will be thrown from what feels like every direction. But always move forward. Start fresh every morning. Whatever happened yesterday does not define today. Start each day off by making your bed and brushing your teeth (*a few small victories to start your day off right – another tip I learned from the military) and get your morning to-do’s done and work your way to lunch. And then when lunch comes, make it through to dinner, and then go to bed knowing that tomorrow is a clean slate. No matter what you do – always move forward. No matter what kind of day you had – whether it be at home, with a client not being happy with what you produced, or by losing a dream client – always move forward. If you are in a point in your business where burn out is real, where you are lacking motivation and you find that your passion is no longer there – take a step back and allow yourself some time to breathe. Everyone needs some time off from time to time to gain some perspective, to give yourself some grace, and to reevaluate all the things. And when you are ready sit down and write out your whys and your goals – professionally and personally. You will find that after a bit of time off – whether a couple of days, a week, or even a month you will see that things become clear again. After doing this and being more intentional about my goals for Writefully Simple, and for finally attracting my ideal client on a regular basis – I can say that this is the best season of my business yet and I am so excited to see what 2018 has in store! Are you in the phase of burnout in your business? 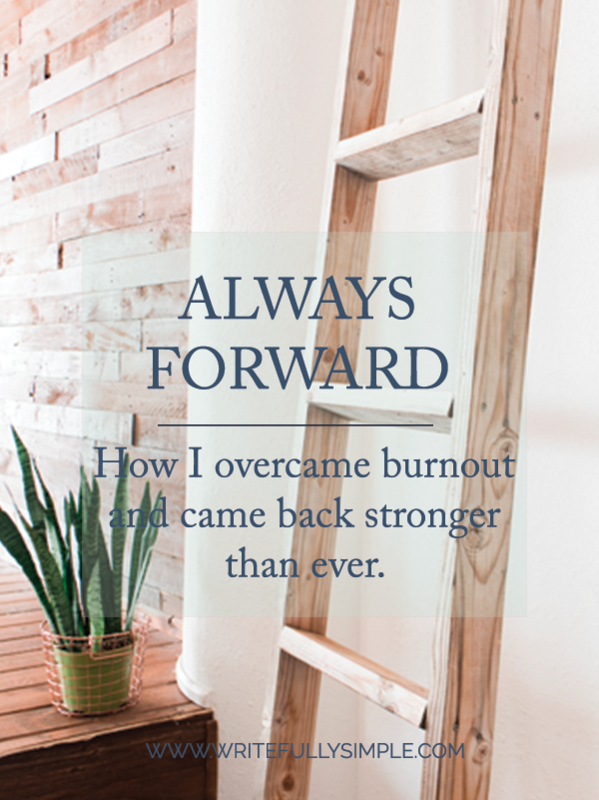 Comment below and let me know if you’ve been there and how you got yourself out of the burn out funk, or let me know if you some encouragement. I felt this, thank you! Always here to cheer you on…Love ya lady? You are still one of my favorite human beings on this damn planet. Love you! This was my ENTIRE 2017 and it’s been hard, dark, and messy. But always forward indeed! It’s nice to know I’m not the only one who has struggled with LIFE and that there is nowhere to go but UP. Cheering you on as you head into 2018! I am so sorry to hear about your year. That definitely never makes it easy. But here is to a great 2018 – I’m wishing you nothing but the best! !